67mm Lens Accessories Kit w/ 67mm ND Filters Kit, 67mm Lens Hood, 67mm UV Filter, 67mm Lens Cap + Camera cleaning kit for all Lense and Cameras with a 67mm Lens thread. 67mm Accessories KIT For Nikon Cameras Included is a 3 Piece 67mm ND Filter set (ND2 ND4 ND10) + 67MM Hard Lens Hood + 67mm UV Protection Filter + 67mm Lens Cap and a lens cap keeper + Cleaning blower and pen + HeroFiber ultra gentle cleaning cloth. All accessories are compatible with all Lenses and Cameras with a 67MM Lens Thread. NOTE: Please verify the size of your lens thread prior to purchasing 67mm Lens Accessories are compatible with the following lenses and ALL Lenses and Cameras with a 67mm Lens Thread.CanonCanon EF 70-300 F4-5.6 IS II USMCanon EF-S 18-135mm F3.5-5.6 IS USMCanon EF-S 10-18mm f/4.5-5.6 IS STMCanon EF 70-200mm f/4L USMNikonNikon AF-P Nikkor 70-300mm F4.5-5.6E ED VRNikon AF-S DX Nikkor 18-300mm F3.5-6.3G ED VRNikon AF-S DX Nikkor 18-140mm f/3.5-5.6G ED VRNikon AF-S Nikkor 70-200mm f/4G ED VRNikon AF-S Nikkor 28mm f/1.8GNikon AF-S Nikkor 85mm f/1.8GSonySony FE 85mm F1.8Sony FE 24-70mm F4 ZA OSS Carl Zeiss Vario Tessar T*Sony FE 28-70mm F3.5-5.6 OSSSony E PZ 18-200mm F3.5-6.3 OSSand all Lenses and Cameras with a 67mm ThreadHEROFIBER CLOTH - Included is a HeroFiber ultra gentle cloth that is specially designed to clean electronics and accessories. 67MM Lens Accessories KIT - Included is a 67MM Hard Lens Hood 67mm UV Protection Filter + 67mm Lens Cap and a lens cap keeper for Lens and Cameras with a 67MM Thread Size - NOTE: Please verify the size of your lens thread prior to purchasing 67mm Lens Accessories are compatible with the following lenses and ALL Lenses and Cameras with a 67mm Lens Thread.CanonCanon EF 70-300 F4-5.6 IS II USMCanon EF-S 18-135mm F3.5-5.6 IS USMCanon EF-S 10-18mm f/4.5-5.6 IS STMCanon EF 70-200mm f/4L USMNikonNikon AF-P Nikkor 70-300mm F4.5-5.6E ED VRNikon AF-S DX Nikkor 18-300mm F3.5-6.3G ED VRNikon AF-S DX Nikkor 18-140mm f/3.5-5.6G ED VRNikon AF-S Nikkor 70-200mm f/4G ED VRNikon AF-S Nikkor 28mm f/1.8GNikon AF-S Nikkor 85mm f/1.8GSonySony FE 85mm F1.8Sony FE 24-70mm F4 ZA OSS Carl Zeiss Vario Tessar T*Sony FE 28-70mm F3.5-5.6 OSSSony E PZ 18-200mm F3.5-6.3 OSSand all Lenses and Cameras with a 67mm ThreadHEROFIBER CLOTH - Included is a HeroFiber ultra gentle cloth that is specially designed to clean electronics and accessories. 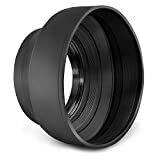 Included is the IDEAL 67mm PRO Lens Filters and Lens Hood Accessories KIT that enable capturing Extraordinary Photo and Videos Indoor, Outdoor, Under/above water and with various light settings. The 67MM Filters and Lens Hoods are compatible with all 67mm Lenses and Cameras including CANON EOS 70D 60d 60Da 7D 6D 5D 5DS 5DSR 7D Mark II 5D Mark II 5D Mark III EOS REBEL T6i T6S T5 T5i T4i T3 T3i T2i T1i SL1 EOS M EOS M2 EOS 8000D 760D 750D 700D 650D 600D 550D 1200D 1100D 100D XTi XT XSi and ALL 67mm Lenses and Cameras. 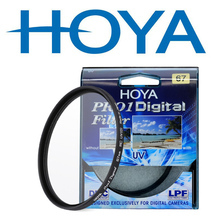 The Ultimate 67mm Lens Filter and Lens Hood Accessories KIT Includes: 67mm Close-up Macro Filters (+1 +2 +4 +10) designed for capturing close-up shots on small objects such as coins, insects and flowers + 3 67mm HD Filters including a UV Protections filter, designed to filter out UV rays and to protect the glass of the lens from common damage such as cracks and moisture + Circular Polarizing filter (CPL) designed to control and balance color on raw film and photos + FLD Filter knows as the Fluorescent filter, designed to filter out unwanted Neon fluorescent light + Includes: 67mm ND2 Filter + 67mm ND4 Filter + 67mm ND8 Filter + These Filters are designed to control and balance light and give a warmer look for sharp images, great filters to carry while shooting indoor and outdoor Photos and Videos. In addition the 67mm Kit includes a 67mm Tulip shaped Hard Lens hood and a 67mm Soft Rubber Lens Hood + 67mm Lens Cap and Lens cap holder + a Protective Wallet Case with individual compartments to store and protect each filter individually from common damage such as accidental dropping and scratches + a HeroFiber® Ultra gentle cleaning cloth designed for extra care and gentle cleaning of sensitive electronics and accessories and a 1 year limited warranty and backed by Xtech 1 year warrantee. DESCRIPTION:Altura Photo® 3-in-1 Collapsible Rubber Lens Hood Shade for Camera LensesThe Altura Photo® Collapsible Rubber Lens Hoods are one of the most important accessories you can purchase to help improve the quality of your photographs. The collapsible hood eliminates flare caused by stray light, and also adds the benefit of protecting your lenses from unexpected bumps. Suitable for zoom, telephoto, standard, and wide angle lenses.FeaturesGuards lens from bright extraneous light for improved image quality.3-in-1 Collapsible design:Fully retracted for use with wide angle lenses, and for storage.Extend midway for use with standard lenses.Extends fully for use with telephoto lenses. Heavy-duty rubber material protects against bumps and abrasions.Internal mounting threads accepts filters and lens caps.CompatibilitiesPlease verify your camera's lens thread size before ordering. Your camera's lens thread size will be marked somewhere on the lens barrel or printed underneath your lens cap.This number is always preceded by a "Ø" (diameter) symbol. 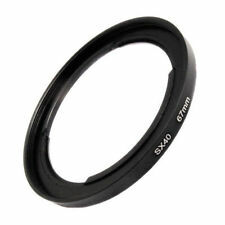 For example: Ø67= 67mm lens thread size.Note: This lens hood may not be suitable for use with ultra-wide angle lenses. Vignetting, a soft or heavy shading of the lens, might occur in certain instances even when the hood is fully retracted. Includes: 67MM Altura Photo 3-in-1 Collapsible Rubber HoodPrevents lens flare caused by extraneous light and protects against unexpected bumps or shock.3-in-1 design for use with wide-angle, standard, telephoto zoom/non-zoom lenses. The 72mm-67mm ring adapter easily screws onto the front of any 72mm lens, and converts the thread size of your lens to the thread size of any other 67mm accessory (such as filters, hoods, flashes and lens converters).For CALIFORNIA residents only: WARNING: This product contains chemicals including DEHP, which is known to the State of California to cause cancer and birth defects or other reproductive harm.Please note that by posting this Proposition 65 warning, we are notifying you that one or more of the Proposition 65 listed chemicals may be present in a product. With Unique Bargains' products, the exposure to these chemicals may be of no significant risk to you, but out of caution, we have elected to place this warning on our site to make sure our customers are informed.You can find more information at http://www.oehha.ca.gov/proposition-65/about-proposition-65. Prevents lens flare caused by extraneous light and protects against unexpected bumps or shock..
3-in-1 design for use with wide-angle, standard, telephoto zoom/non-zoom lenses.. Please verify your camera's lens thread size before ordering. Your camera's lens thread size will be marked somewhere on the lens barrel or printed underneath your lens cap. This number is always preceded by a "Ø" (diameter) symbol.. Compatible with the CANON EOS 80D Digital SLR Kit with EF-S 18-135mm, CANON REBEL (T6i T6 T5i T5 T4i T3i T2i), EOS (700D 650D 600D 550D 70D 60D 7D) DSLR Cameras with the 18-135mm EF-S IS STM zoom Lens..
Also compatible with the NIKON Nikon D7200 DX-format DSLR w/ 18-140mm VR Lens and D5300 D5200 D7000 D7100 DSLR Cameras with18-105mm f/3.5-5.6 AF-S DX VR ED, 18-140mm f/3.5-5.6G ED VR AF-S DX Zoom Lens..
Altura Photo 3-in-1 Collapsible Rubber Lens Hood Shade for Camera Lense The Altura Photo Collapsible Rubber Lens Hoods are one of the most important accessories you can purchase to help improve the quality of your photographs. The collapsible hood eliminates flare caused by stray light, and also adds the benefit of protecting your lenses from unexpected bumps. Suitable for zoom, telephoto, standard, and wide angle lenses.Features- Guards lens from bright extraneous light for improved image quality.- 3-in-1 Collapsible design:Fully retracted for use with wide angle lenses, and for storage. Extend midway for use with standard lenses.Extends fully for use with telephoto lenses.- Sturdy rubber material protects against bumps and abrasions.- Internal mounting threads accepts filters and lens caps.Compatibilities Please verify your camera's lens thread size before ordering. Your camera's lens thread size will be marked somewhere on the lens barrel or printed underneath your lens cap. This number is always preceded by a "Ø" (diameter) symbol. 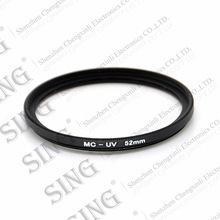 For example: Ø67 = 67mm lens thread size.Note: This lens hood may not be suitable for use with ultra-wide angle lenses. Vignetting, a soft or heavy shading of the lens, might occur in certain instances even when the hood is fully retracted. 67mm PRO Accessories KIT For 67mm Lenses and Cameras Included is a 67mm 3 Piece Filter set containing a UV Filter, CPL Filter and FLD Filter + 67mm ND Filter Set (ND2 ND4 ND8) + a 67mm Hard tulip shaped and soft rubber lens hoods + 67mm Lens Cap + Lens cap keeper + Cleaning Blower and pen + HeroFiber ultra gentle cleaning cloth. All 67mm Lens Accessories in this kit are compatible with all Lenses and Cameras with a 67MM Lens Thread. NOTE: Please verify the size of your lens thread prior to purchasing67mm Lens Hoods are compatible with the following lenses and ALL Lenses and Cameras with a 67mm Lens Thread.CanonCanon EF 70-300 F4-5.6 IS II USMCanon EF-S 18-135mm F3.5-5.6 IS USMCanon EF-S 10-18mm f/4.5-5.6 IS STMCanon EF 70-200mm f/4L USMNikonNikon AF-P Nikkor 70-300mm F4.5-5.6E ED VRNikon AF-S DX Nikkor 18-300mm F3.5-6.3G ED VRNikon AF-S DX Nikkor 18-140mm f/3.5-5.6G ED VRNikon AF-S Nikkor 70-200mm f/4G ED VRNikon AF-S Nikkor 28mm f/1.8GNikon AF-S Nikkor 85mm f/1.8GSonySony FE 85mm F1.8Sony FE 24-70mm F4 ZA OSS Carl Zeiss Vario Tessar T*Sony FE 28-70mm F3.5-5.6 OSSSony E PZ 18-200mm F3.5-6.3 OSSand all Lenses and Cameras with a 67mm ThreadHEROFIBER CLOTH - Included is a HeroFiber ultra gentle cloth that is specially designed to clean electronics and accessories.